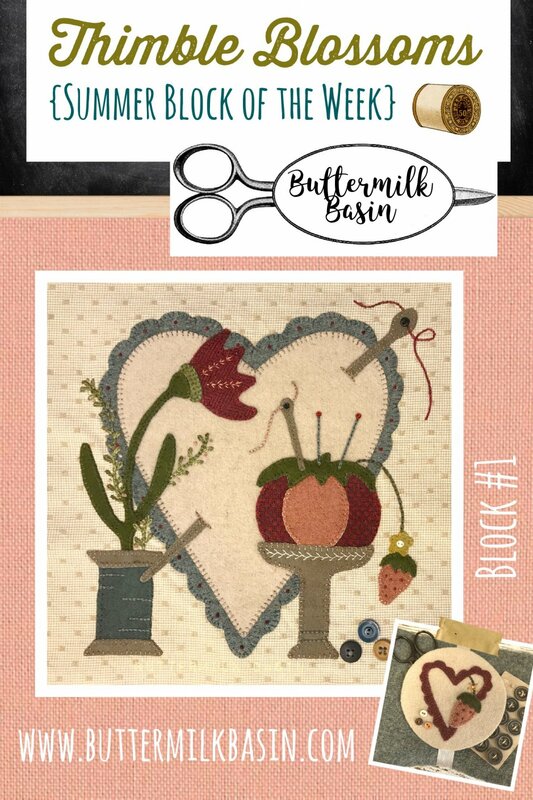 Thimble Blossoms Block of the Week! Welcome to our “1st Annual” Summer Block of the Week! Due to numerous requests, we are excited to start something new & exciting! 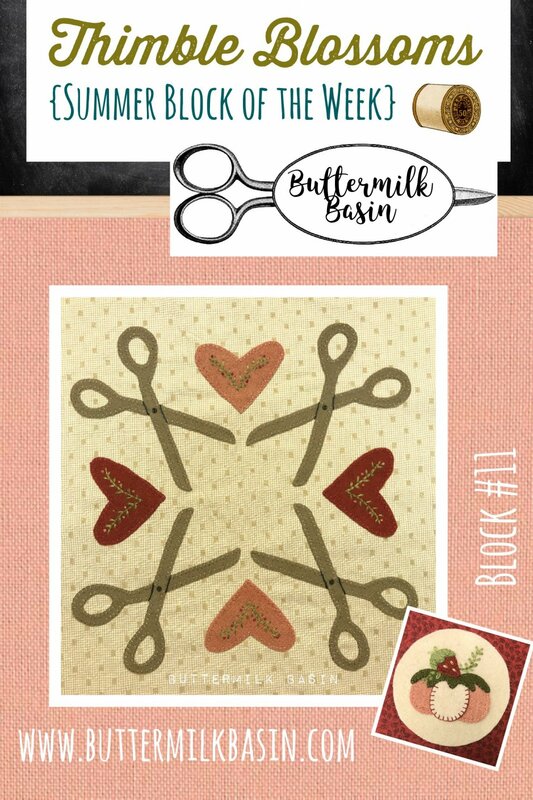 This year’s SBOW is “sewing themed” and features 12 glorious blocks of some of my favorite sewing notions & a few lovely flower “blossoms” tucked in! Our sewing rooms should be “blooming” with happiness & inspiration! This will be the “ONE” quilt you’ve always wanted to make for your sewing room! I am excited to start this journey with you! *Starts June 1st and runs thru August 17th * EXTENDED thru our FALL into Autumn Event!!!! 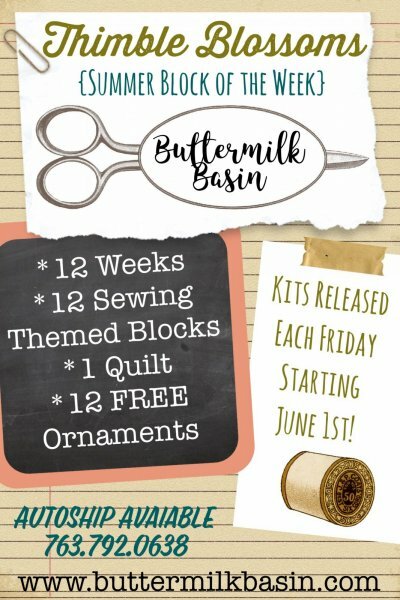 Every Friday, for the next 12 weeks we will be releasing a block in kit form. A finishing kit will also be available on the 12th week. Call the shop anytime during the program to sign up for autoship and to "catch up" to the current block, 763-792-0638. *Price is $25.00 per week plus shipping $3.95 (for U.S. customers, International orders will be invoiced for additional shipping). The 12th week will be more, as the finishing kit will be included in that shipment. *Block sizes are cut to 13 X 13 inches and will finish 12 X 12 inches. The inside of the quilt will measure 36 X 48 inches with borders to follow. *Kit will include a full color pattern, background fabric & all the wool needed to complete the block. The blocks will ONLY BE AVAILABLE for the next 12 weeks in kit form only. *A “FREE” ornament pattern/kit will be included for those who sign up for autoship by calling the shop to sign up for the 12-week commitment and finishing kit. We will keep the finishing kit as minimal in price as we can! If you DO NOT sign up to receive the full 12 weeks, the ornaments will NOT BE included in your kit. The ornaments are darling and measure 3.75 inches round. *The 12 “FREE” ornaments that you receive can also be made into an additional larger design/pattern and that pattern will be included “FREE” on the 12th week or when it is available! 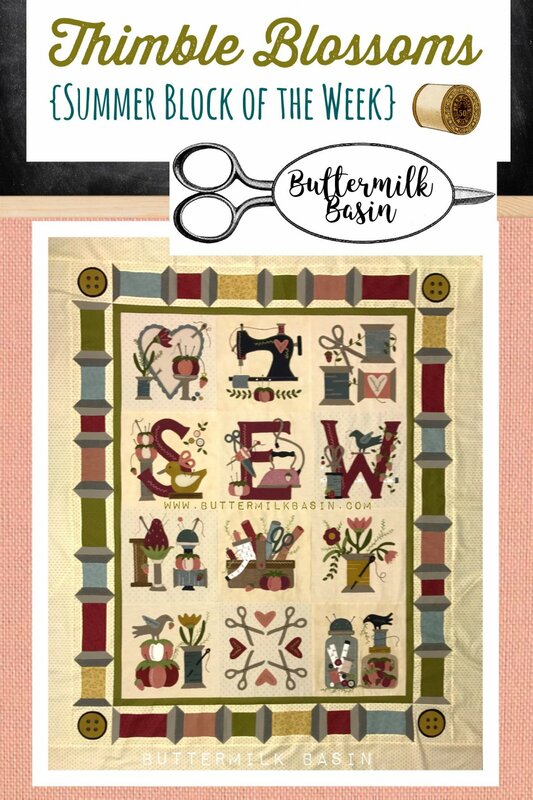 A kit to purchase will also be available to make the design that will coordinate with the quilt if you choose to make it! *A button kit will be available later! *Please feel free to call the shop at any time for further assistance. Join the Summer Block of the Week! 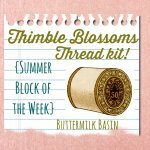 The Thimble Blossoms SBOW runs for 12 weeks, the cost is $28.95 per week (includes shipping for customers in the U.S.). Please call the shop to sign up for auto ship, 763-792-0638. 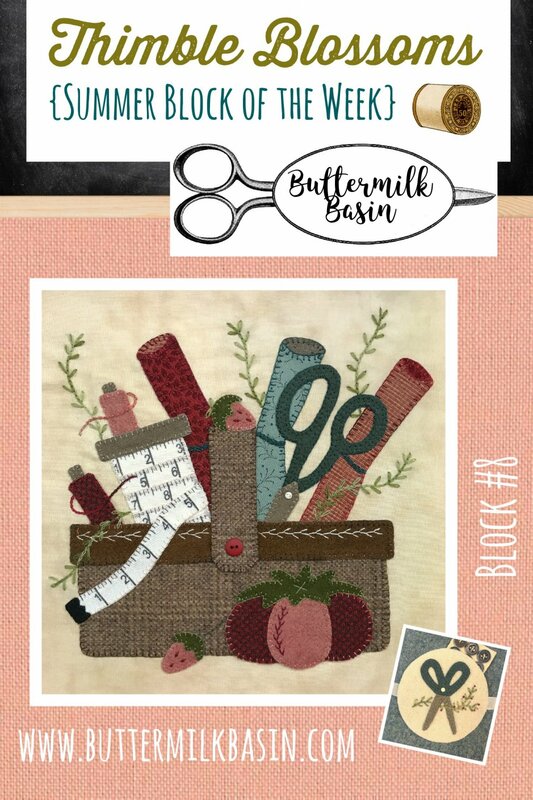 Here is the button pack that contains the 52 buttons that were used on the 12 blocks of the Thimble Blossom Summer Block of the Week! 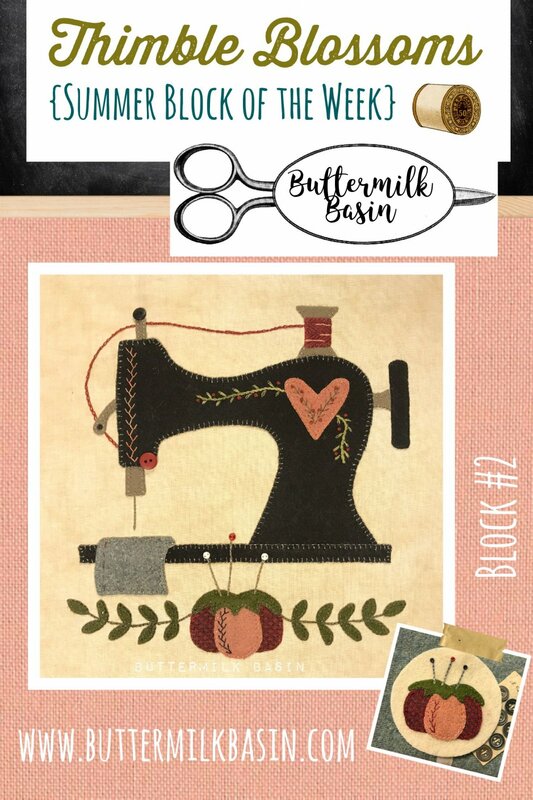 Our Summer Block of the Week continues with block #2, a darling sewing machine! 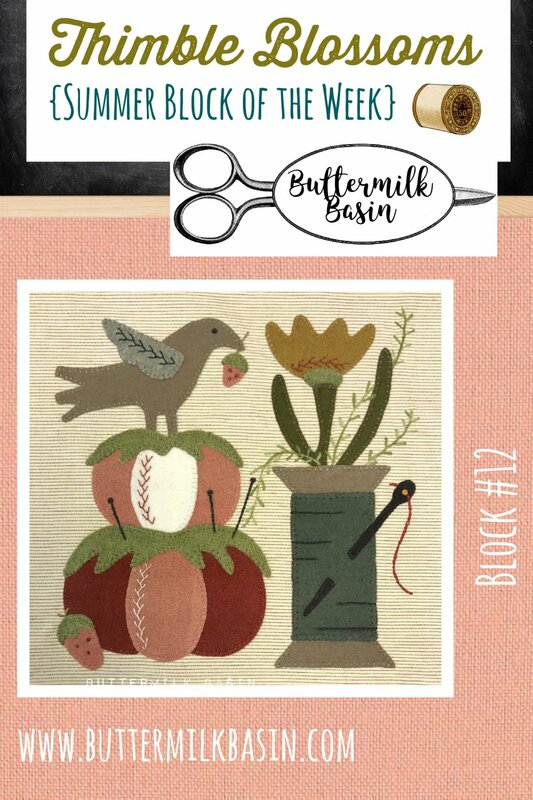 The kit includes the full color pattern, background fabric, and wool to complete the block! 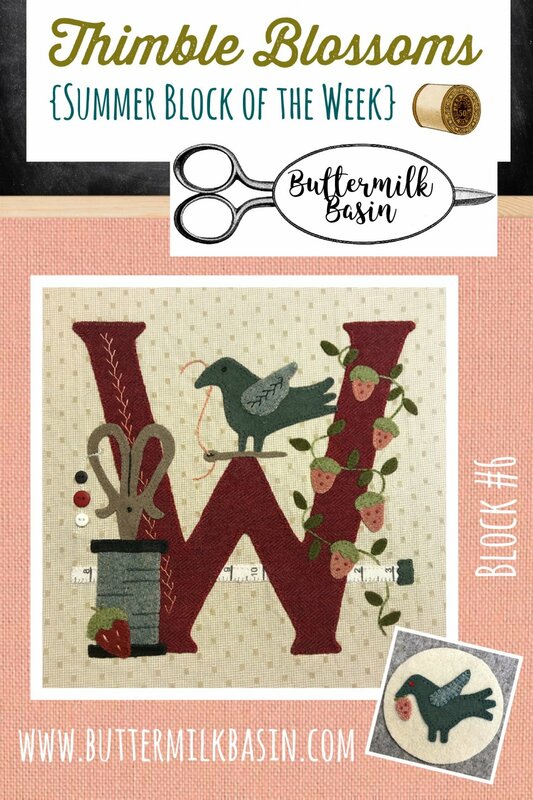 Our Summer Block of the Week continues with block #3, with 3 spools and a scissor, all done in gorgeous wools! The kit includes the full color pattern, background fabric, and wool to complete the block! You can still sign up for autoship! 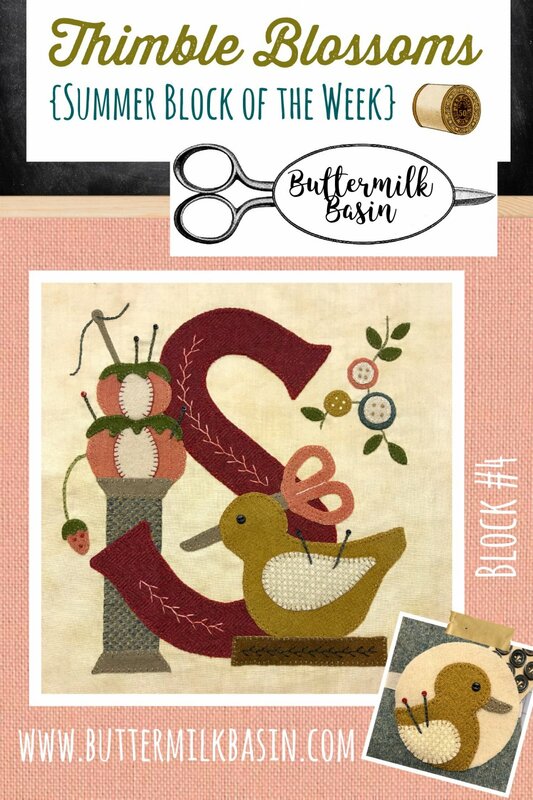 Our Summer Block of the Week continues with block #4, featuring the letter S - guess what we are going to spell!?! The kit includes the full color pattern, background fabric, and wool to complete the block! You can still sign up for autoship! 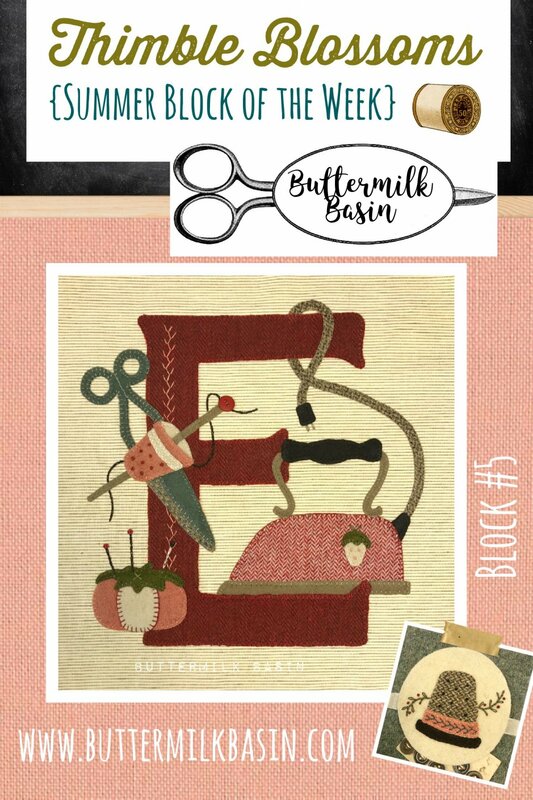 Our Summer Block of the Week continues with block #5, featuring the letter "E" with a vintage iron and sewing supplies! The kit includes the full color pattern, background fabric, and wool to complete the block! You can still sign up for autoship! Starting the 3rd row of our gorgeous block of the week! 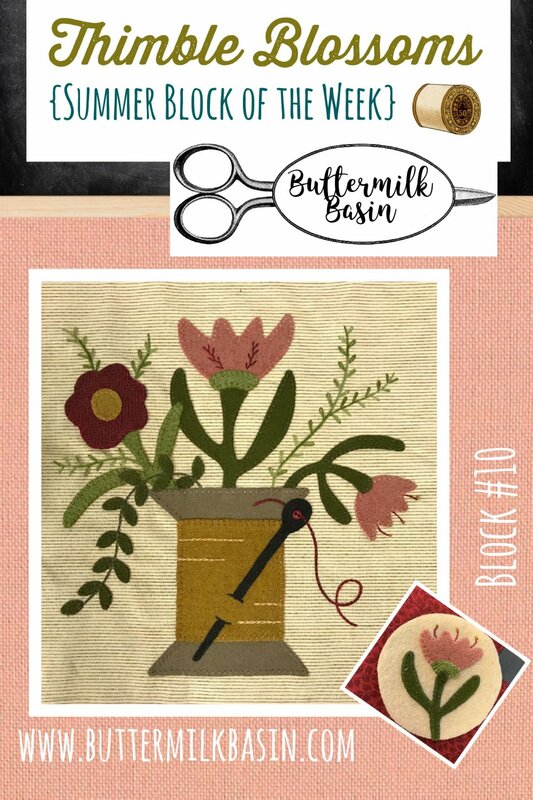 This block features spools and pincushions, that we all love to decorate our sewing spaces with! The kit includes the full color pattern, background fabric, and wool to complete the block! 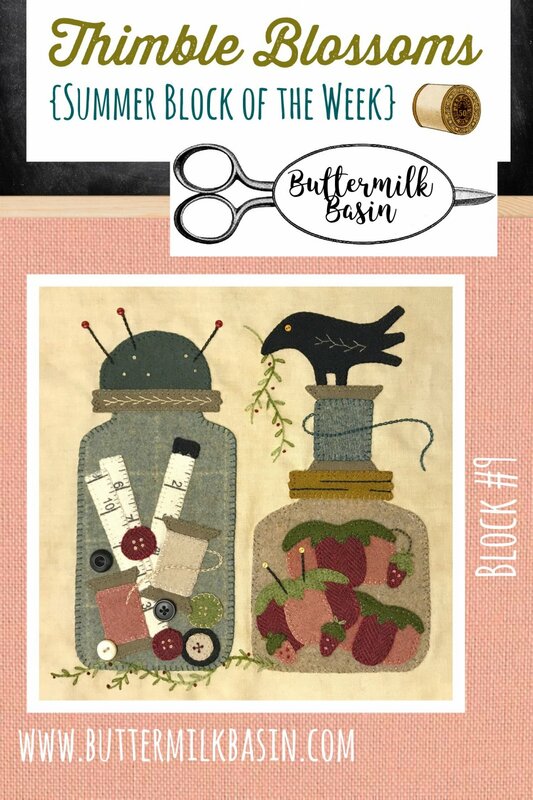 Block 9 of Thimble Blossoms features 2 old jars filled with sewing supplies, buttons, spools, tape measure, and pin cushions! The kit includes the full color pattern, background fabric, and wool to complete the block! 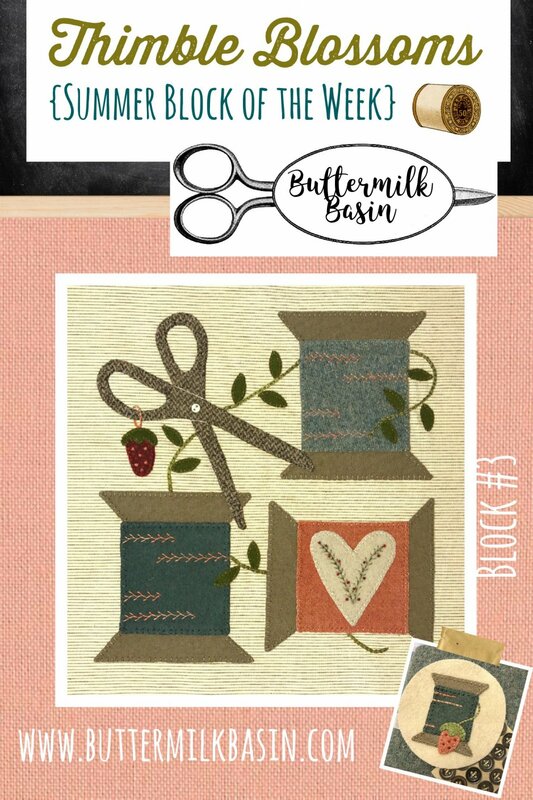 This week's block is simply scissors and hearts! The kit includes the full color pattern, background fabric, and wool to complete the block! Call the shop at 763-792-0638 to sign up for autoship to get a "FREE" ornament kit. 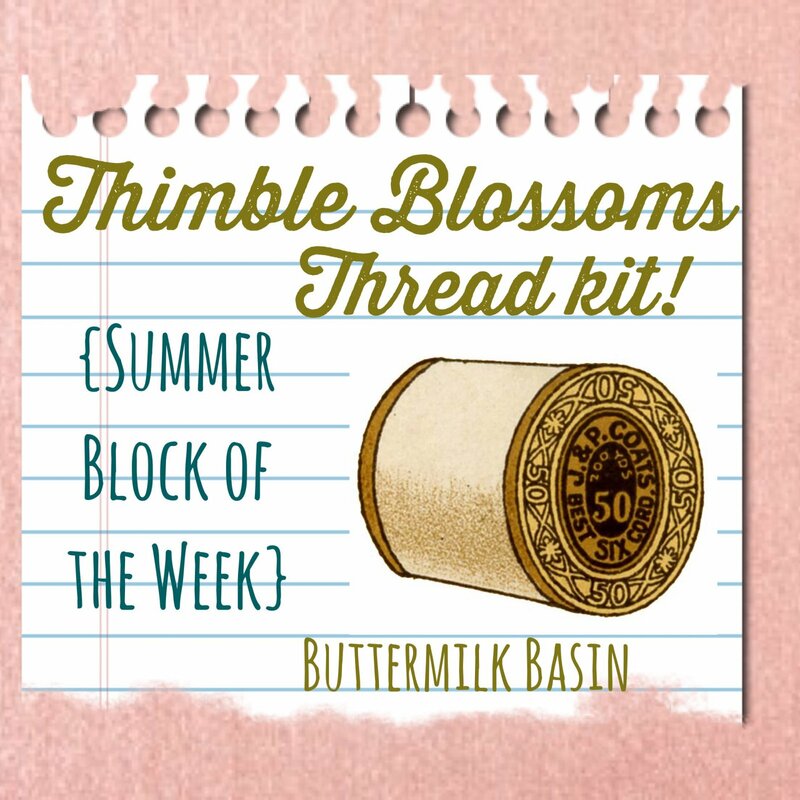 The starter thread kit for the Thimble Blossoms Summer Block of the Week includes 14 lovely hand over dyed pearl cottons and floss skeins in various weights that you will use to make this beautiful block of the week!